Hi, based on the helpful WGAN recommendations, I bought the Desmond DLEV-1 Leveler Level (along with Manfrotto MT190XPRO4) since I liked the idea of leveling without having to continuously adjust the tripod legs. However, I've been having an issue and wondering if it's normal or just me - one of the 3 levelers and its screw seems to "wobble" once the camera is mounted on it, as in it doesn't keep the plate stable and I can wobble the plate and camera . I've tried a few different tightenings and adjustments but nothing gets the leveler fully sturdy to where it stays firm in place. My scans often come back with the "Camera not stable" message so I wasn't sure if this was the cause (luckily the scan once processed didn't seem impacted much). I even exchanged the leveler for a replacement in case it the first was defective but same issue with the 2nd. While I like and r commend it, other WGAN Forum Members have reported the same challenges you describe. I like that you tried a second one. I wonder if there is a quality control issue since I am happy with mine. Are all your levels about equal when you start out? My Desmond DLEV-1 Leveler has been solid. If you are getting "Camera not stable" issues. You are on the right path tightening everything down. Are you scanning with the Tripod legs all the way up or do you raise the center column when scanning? I have found the Center Column lock on the Manfrotto to get loose easily when getting that error. @PlusUltra - I would say dump it and work with the legs. I dumped mine and ended up replacing my tripod soon after (3 year life). I have found the built in level on the MT190XPRO4 and leg movement to work faster anyway. 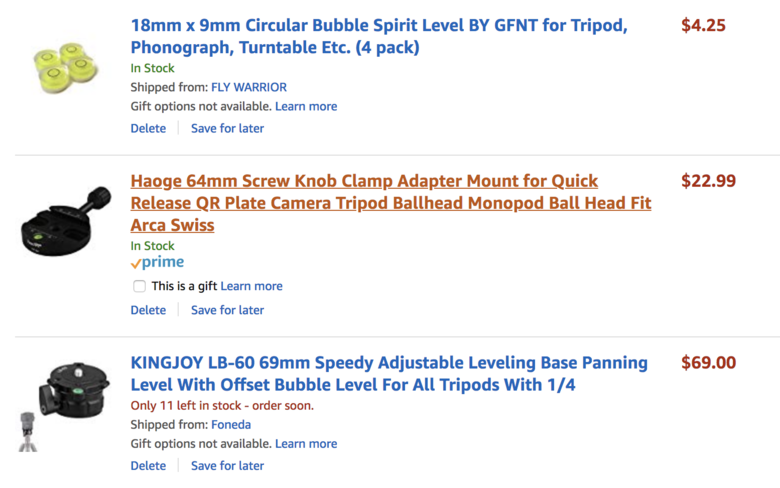 Plan on replacing the tripod more often as an upcoming expense that will probably be inevitable is my situation. Which clamp are you using? I'm using the [url=https://www.amazon.com/dp/B010W8UML6?tag=gb089-20]Clamp that came with the Desmond DLEV-1/url]. I have read about other clamps not tightening as well to the base. My previous clamp was so bad I needed pliers to tighten my camera mount. Perhaps the issue could be here. Okay, I'm about to share my top secret for speedy leveling. I switched to using these two pieces plus a $3 plastic circular bubble level stuck to the top of my Pro camera nearly two years ago and it changed my MP life. Quick ONE-step leveling anywhere, stairs, bumps, whatever. Never takes me more than 5 seconds to level. The $3.00 bubble level I got at OSH, the other two pieces on Amazon. Similar bubble levels also on Amazon as pictured. Parts have worked dependably for me for two years. @VTLV I'm using that same discal clamp that came with the Desmond leveler too. Thanks for the perspective on relying on my tripod more - I probably shouldn't have expected the leveler alone to be the perfect solution/convenience. I appreciate the help! @Home3D Thanks so much for sharing! Looks like a solid setup - I'm just getting started so am open to all solutions and hearing what works for everyone here with tons of experience helps a lot. I LOVE this Kingjoy ball level as it's incredibly fast to use. I think someone on the forum wrote that they had one wear out after a while, but mine has worded flawlessly. I may buy another just in case the product is ever discontinued.